TWO NATIONAL PARKS SIT AT OUR DOORSTEP: MOUNT REVELSTOKE & GLACIER. Gather your family and circle the trunk of an ancient rainforest tree, stand on a mountain summit, and take in vivid alpine wildflowers in full bloom. Drive up Mount Revelstoke National Park on the Meadows in the Sky Parkway. The paved road weaves gently up through an evergreen amazon of hemlock, white pine, and alpine larch; delivering you first to Beaver Lodge Kids Bike Park, then the Nels Nelson exhibit—site of the first ski jump in Canada. You can literally step into “Nels’ Knickers” at an interactive sculpture that lets you lean into the air like a ski jumper. From here, wander into Inspiration Woods, make a foray into the Skunk Cabbage patch, or cruise the Sorenson trails. Keep your cultural voyage on the rails at the Rogers Pass Discovery Centre, 65 kilometres east, where you’ll learn the turbulent history of the transcontinental railway’s passage through the sky-scraping Selkirk Mountains, in Glacier National Park. Saunter through the bursting orange wildflowers in the meadows at the top of Mount Revelstoke National Park. As the alpine gives way to moss and heather, lingering ice and snow frame impressive granite walls in the distance. Hike to either Balsam Lake, Eagle Knoll, Koo Koo Sint, Heather Lake, or First Footsteps for a solid introduction to the area. For a bigger itinerary, step up your stride in Glacier National Park with a visit to Marion Lake. Follow the steep, forested trail up Abbott Ridge as far as you’re comfortable; into the amphitheatre of glaciated peaks ringing in rocky harmony. REVELSTOKE NATIONAL PARKS HIKING MAP: Pick up yours for free from the Revelstoke Visitor Centre @ 301 Victoria Rd or visit our website. REVELSTOKE SITS IN THE THICK OF BC’S ONLY INLAND TEMPERATE RAINFOREST. Your boots were made for walking and these trails were made for those boots. From short river-valley flats to long alpine ridges, we’ve got you covered. Downtown Revelstoke’s Greenbelt river trails are as short or as long as you want to make them. With easy in and out points all along the way, these paths are also home to roughly 60 species of beautiful birds for watching. You can also visit Sutherland Falls in Blanket Creek Provincial Park. It’s a 5 minute walk to a 60 ft. chute of cascading water that brave kayakers sometimes take a puckering plunge down. Enjoy them cozily from dry land! For another impressive wall of tumbling water, wind your way down Highway 23 South to the Begbie Falls Forest Service Road. Park at the end of the pavement or keep driving. If you park, use the Begbie Creek Trail to traverse through the mossy forest of giant trees and connect onto Begbie Falls Trail. Once at the Begbie Falls Recreation Site, it’s a short, steep hike on to the falls along the signed trail. After you take in the mist, get some sun and an unfiltered view of the Selkirk Mountains down on the pebble beach along the Upper Arrow Lake Flats. There’s no more iconic a peak in Revelstoke than Begbie, with its soaring double summits bursting out of a glacier aproned around it. Named for a famous 19th century judge with a stiff upper lip, this mountain is serious. The trail is steep and there’s an outstanding reward in views, but it only comes after several hours of hiking. Once you reach the campsite where the vistas begin in the alpine, you’ll need mountaineering skills to carry on any farther. There’s a glacier to cross and an exposed scramble to the top. REVELSTOKE HIKING MAP: Pick up yours for free from the Revelstoke Visitor Centre @ 301 Victoria Rd or visit our website. Your Packs, outdoor,tents, travel sleeping & ski outfitter. bags, cookware, clothing, accessories, and footwear, for Packs, tents, sleeping bags, cookware, accessories, and footwear, hiking, camping, snow sports,clothing, and travel. Specializing in bestforinhiking, class and value. camping, snow sports, and travel. Specializing in best in class and value. FROM LOAMY STEEPS TO FLOWY PACKED GOLD, REVELSTOKE’S SPRAWLING SINGLETRACK AND EPIC ALPINE RIDES ARE SECOND TO NONE. Home to nine unique riding zones and one of BC’s first adaptive mountain bike trails, we’ve got something for everyone. MacPherson’s Flowdown is the buffest trail around and will keep you swooping for a solid morning with all sorts of possible linkups and add-ons. For a longer version of the same with an alpine backdrop, carry on to Frisby Ridge. The 12-kilometre out-and-back (24 kilometres return) cross-country trail traces a near perfect ridge at incredibly civilized grades to a glassy alpine lake. If you’ve still got juice, hammer another 5.7 kilometres on the extension, blasting up and back down snaky berms and rolling landscape. Back at the parking lot, the Ultimate Frisby Connector is a tempting downhill add-on but, take note, it gets full-on by the time you hit the Ultimate Frisby DH trail. WELCOME TO ONE OF THE BEST ALL-ROUND MOTO ZONES IN BC. Featuring two main trail-riding areas, a full-sized motocross track, a challenging endurocross track, and a popular kids/beginners track. Take Westside Road 10 kilometres north of downtown Revelstoke to find the trail system, where there are kiosks with maps at each riding zone. Kids and beginners can warm up on the beginner track, trail-bound full-sized humans can head towards Kick Start and Easy Street. Want to check out the action before deciding if you’re into trying it? There’s a handy viewing platform to spy the scene. Get your heart pumping on the full-sized motocross track—sending floaty doubles, long tables and poppy step-ups to your heart’s content. Then ride over to Rowlands Revenge, the relentless tacky loop climbs high above the lake to some of the best views going—if you’re not busy whiskey-gripping your bars! To start, dig into Ego Trip in the Lower Frisby zone, then work your way up and onto the Deadman’s Creek network for a total of 75 kilometres of purpose-built moto trails to work through. Follow the Yellow Brick Road on your journey towards the techy stuff and catch glimpses of glassy Lake Revelstoke shining below. REVELSTOKE DIRTBIKING MAP: Pick up yours for free from the Revelstoke Visitor Centre @ 301 Victoria Rd or visit our website. THE BEST SEAT IN THE HOUSE. Take a tandem paraglide flight over the Columbia River, or land on a remote mountain peak with a helipcopter tour. If you’ve never been in a helicopter, there’s no better place to experience unfettered flight. Cover miles in minutes and get an unequalled perspective. Hover comfortably over Wap Lake or the Revelstoke Dam, buzz over the Upper Arrow Lake Flats, swoop by waterfalls, rivers, and even tumbling glaciers. It’s a frickin’ helicopter, you can go anywhere! Experienced flyers can bring their own wings and launch off the top of Revelstoke Mountain Resort, reaping the thermal currents born from the river valley below. For safety, please be sure to brush up on the rules and local beta at Revelstokeparagliding.com. It’s time for that tandem paraglide flight you’ve always talked about. Starting from 2,200 metres above sea level, sail off Mount Mackenzie, the highest launch in North America. All pilots are certified by the Hang Gliding and Paragliding Association of Canada. Tandem flights are open to all ages, you don’t need any previous experience, and you can do it year round. Quit talking, start doing! Take your adventure to new heights! Sightseeing tours, heli-biking, heli-weddings, heli-picnics, airport transfers, and custom charter work. FROM SPORT TO TRAD, SINGLE PITCH TO MULTI, COME HANG ON OUR ROCK AND FIND YOUR FLOW. Routes ranging from 5.8 to 5.13a. If you’re quite green, we recommend taking a lesson or hiring a guide to show you the ropes. Otherwise, pick up a copy of the Revelstoke Rocks guidebook by Ruedi Beglinger from one of the outdoor stores downtown. He’s the guy that first established many of the climbs in the area, and his book remains the best resource to this day. Next, head 10 minutes down Highway 23 South to Begbie Bluffs, with awesome single-pitch sport-climbing options for kids, beginners and even first climbing dates. The crag is a short walk on a well-defined trail from the parking lot. Start with High & Dry or Bifacial Retouch (5.8 and 5.9 respectively). Shaketown is a little farther down the highway from Begbie Bluffs, with a further plethora of single-pitch intermediate routes, like Quicksilver Daydreams (5.10b), Two Hands (5.11a), and Flying Shoes (5.11b). To start on some multipitch, drive another 10 minutes down the highway to the shady and river-cooled Blanket Creek Canyon and walk 10 minutes to Blanket Buttress. Next, crimp and heel hook your way up the Blanket Arête (5.10a), or Tree Line (5.10c) and keep building from there. Waterworld may be a mediocre movie, but it’s a mind-blowing climbing wall. To tag the towering cliffs rising right out of Lake Revelstoke, you first rappel down to belay stations made of planks bolted to the wall. Choose from two to four pitches as you work your way back up routes ranging from 5.10b to 5.12a, these are longer climbs. Start on Pirates of Waterworld (5.10b) and No Panic In The Titanic (5.11b) and eye up other routes from there. Remember to watch for rock fall, and to wear a helmet even when belaying. WANT MORE INFO? Check out the Rock Climbing page on our website. LAKE REVELSTOKE HOLDS 130 KMS (81 MI) OF WILD, SECLUDED AND COOL GLACIER-FED WATERS. Magnificent rivers also flow through Revelstoke: the Illecillewaet, Jordan, and Columbia, just to get started. Big, flat, and glassy. Lake Revelstoke is prime for an easy kayak, stand-up paddleboard, or canoe tour. It’s perfectly cool on a warm summers day! Tours meander into coves and adjoining river systems that make up the major dividing waters of the Monashee and Selkirk Mountains. Go to Martha Creek Provincial Park for lunch along the pebbly beach or to lay on the grass. For the warmest water, hit up Williamson Lake back in town, with a sandy beach, playground, and mini putt. If you’re comfortable navigating without a guide, rent a canoe or kayak for yourself. Lake Revelstoke, the Columbia River, or Upper Arrow Lake are all dotted with hidden waterfalls and inlets around every bend. Be aware when shimmying into colder waters, fluctuating water levels due to the dams, and watch for anglers and power boaters. If you’re a whitewater kayaker, Revelstoke is full of frothy runs. There’s everything from the class II section of the Lower Jordan to the roaring class IV-V sections of the Illecillewaet’s Box Canyon. You can also check out the Upper Jordan, and the Pingston River. For the very bold, Blanket Creek’s iconic 60-foot Sutherland Falls offers all the airtime you could want. WANT MORE INFO? Check out the Water Sports page on our website. NATURAL ESCAPES KAYAKING & CANOEING See the Mountains, from our View! HOME OF THE LONGEST RUNNING GOLF TOURNAMENT IN BC. The tree-lined, 18-hole Revelstoke Golf Course will woo experienced swingers and newcomers alike. Following Revelstoke’s famous “big eddy” along the curve of the Columbia River, the course is lined with giant trees nourished by temperate waters. “First Tracks” golfers will breathe in an evergreen aroma mixed with freshly cut fairways in the morning mists of the Monashee and Selkirk Mountains. Get 18 holes in casually over 3.5 hours to free up the hottest hours of the day, or linger longer by playing an extra round and hitting the restaurant in the club house. Improve your swing by signing up with one of the PGA of Canada Pros the course has on staff. Work on your precision at the full-length driving range with both synthetic and real-grass tees and down in their practice bunker. Once you’re all tuned up, the Revelstoke Golf Course hosts the oldest tournament in the province every September: The Labour Day Classic. 100% locally owned and operated. Raft with the experts. Over 25 years operating on the spectacular Illecillewaet River, with a commitment to customer care, superior service and our stellar safety record makes Apex your go-to rafting company in Revy. Take a journey down 25 kms of rapids, scenic floats, and the stunning mountain views of Glacier & Mt. Revelstoke National Park. Whether it’s your first river adventure or you’ve rafted many times, we’d love to show off our river to you, blast you through some great white water and send you off on your way... wetter and better! It truly is a beautiful trip. a wild, pristine river. 3-hour trips daily Jun 21 to Sep 1. SEAT SALES and FREE photos! Guaranteed small group sizes. More fun with WATER GUNS! Safer trips with oar rigs, full wetsuits and quality helmets. • Members of BC & Alberta River Outfitters Associations. • 20+ years safety record on 6 different rivers, up to class 4+. • Rated for ages 8+, may vary. THE LONGEST VERTICAL DROP IN NORTH AMERICA AT 5,620 FT (1,713 M). RMR is the only resort in the world to offer lift, cat, heli, and backcountry skiing. Little ones can get their green on in the Turtle Creek beginner area. Grown ones can dip their toes by using the first stage of the gondola to ski from Revelation Lodge, jumping onto Tickle Trunk and the Last Spike to start. Once you’ve got those down, take the gondola up to the Stoke Chair, and hit The Last Spike from there. RMR has some of the widest highways of corduroy on the planet. Make the top pitches of Snow Rodeo, Feller Buncher, and Wooley Bully your first foray, all of them cross back over the Last Spike if you need to dip out. Switch it up by meandering over to the Ripper Chair, where the grooming’s just as delectable and you can segue into some low-angle glades. If those seem easy, dive into Separate Reality off the top of the Stoke Chair. Everyone’s gunning for it on a powder day: North Bowl. Once patrol drops the ropes, traverse skier’s right from the top of the Stoke Chair for the lower entry points, or bootpack the Lemming Line into the upper chutes, where you’ll also find the track over to Gracias Ridge and Greely Bowl. For the highest point on the mountain, take the bootpack straight up to Sub Peak’s tight couloirs, or funnel back down Powder Assault into the upper reaches of North Bowl. There’s also a 14-acre lofty terrain park below the Stoke Chair! THE WAX BENCH - Ski rentals & repairs. THE BEST CAT AND HELI SKIING DESTINATION ON THE PLANET. With two major mountain ranges, a variety of different microclimates and every kind of terrain you can imagine, Revelstoke is the world’s mechanized backcountry skiing capital. Four heli-ski companies and two cat-ski operations base out of Revelstoke with countless other options nearby. You’ll never find more powder options at your tips than in this town. To get the best bang for your buck, first-timers can get take a cat/heli preparation course at Revelstoke Mountain Resort for anyone above age 12. When you’re ready, you can book for the day, multi-day, or multi-night stays based out of a number backcountry lodges or right from town. Go solo and make friends, or bring a group of your own. If you’re not sure whether your skis or snowboard are fat enough, fret not, most tours come with powder specific weapons. Be sure to book early, it’s a popular pastime! Ski & snowboard rentals, and bootfitting. 10 years of providing gear for Revelstoke. We strive to offer the best service. Skookum has a large selection and the biggest brand names in the industry. Come see our selection and take us up on a free ski boot and gear assessment. MICA HELISKIING - Experience the magic. A MECCA FOR EARNING YOUR TURNS. There’s more Gore-Tex per capita in Revelstoke than anywhere else in Canada. With unequaled access to big mountains and deep snow, this place thrives on a culture of going up to get down. If you’re really new to it, hire a local guide. There are tons of amiable mountain maestros ready to safely show you the goods. If you’ve got the basics under your belt, including an avalanche safety training (AST) course, and you want to venture out into some simple terrain, aim for The Fingers on Mount Macpherson. The short laps hold a big payoff in fluffy, open runs you can lap over and over. To get there, park at the Nordic Ski Club Lodge for five bucks and follow the Main Loop to Mountain Climb Trail, then turn left at the sign. The Nordic trail ends at a bridge crossing, and the uphill track starts from here. Rogers Pass in Glacier National Park is a Shangri-La for strong ski tourers and ski mountaineers. Stop in at the Rogers Pass Discovery Centre to make sure you know what’s open and get your permit. There are rolling closures for the highway avalanche-control program you need to pay attention to. Start off on Grizzly Shoulder or Balu Pass, and graduate to the Seven Steps of Paradise—one of the 50 classic ski descents in North America. If you’ve got glacier gear, the Asulkan and Illecillewaet valleys will lead you into the alpine over rewardingly complex terrain and onto iconic peaks. You can also stay at the Asulkan Cabin to break up the slog. Backcountry lodge in the Monashees. 30,000 acres of prime BC backcountry skiing and snowboarding. Heli access lodge south of Revelstoke. Full amenities and private rooms. ACMG guided or self-guided trips - book as full or part groups. XC Skiing: Grab your pup and chase him or her around the popular five-kilometre dog loop at the Mount MacPherson Nordic Centre. Wellmannered dog-owners and dogs preferred; and please remember to pick up their poop! After Rex is tuckered out, let him rest back at the car as you continue around the perimeter loop. Stride clockwise, beginning with Mickey’s Loop, then Main Loop, Loggers Lane, and Hydro Way. Come back around on Beaver Lake, Easy Al’s, and Roadway Ramble. Snowshoeing: Seek out Begbie Falls even in the winter by parking at the beginning of Begbie Falls Forest Service Road, right where the plowed road ends. Follow the trail about 2.5 kilometres to the falls. For Sutherland Falls, park at the Blanket Creek Provincial Park gate (without blocking it) and head down the road for 2.5 kilometres through snow-draped cedars and hemlock. You can also park at the gate of Mount Revelstoke National Park and head past the Nels Nelsen Historic Site into Inspiration Woods, or the Sorensen loops. XC Skiing: Show up after dark and ski six kilometres (3.75 mi) of newly lit trails in the brisk calm of night. Slide farther afield with a headlamp and you can have a picnic dinner at the Ole Sandberg Cabin via the Main Loop. If you want to really crush your workout, add on Hydro Hill. Want to jump into some friendly competition? The Revelstoke Nordic Ski Club presents Headlamp Heroes, a Wednesday night race series. Check www.revelstokenordic.org for race dates. Snowshoeing: Be aware of avalanche terrain and conditions, go to Avalanche.ca for more info. Next, aim for Mount Revelstoke National Park’s Summit Trail, beginning way down low at the Nels Nelson Historic Site. It’s a 10-kilometre trip to the summit from here, mostly under the cover of an evergreen canopy. You can break off the Summit Trail at the seventh road crossing and walk four kilometres to the Caribou Cabin to overnight or reach it by walking a burly 20 kilometres up the Meadows in the Sky Parkway. Book the cabin through Parks Canada. CROSS COUNTRY SKIING MAP: Pick up yours for free from the Revelstoke Visitor Centre @ 301 Victoria Rd or visit our website. SLEDDING. WELCOME TO THE EPICENTRE OF CANADIAN MOUNTAIN SLEDDING. From November to May, Revelstoke gets between 50 to 60 ft (31 to 37 m) of snow in the most accessible big-mountain terrain there is. Pick up the basics and have someone else safely handle the route by booking a tour with a certified guide via a local operator. Ride single or with a partner as you safely venture farther out into the winter wilderness than you’ve ever been before. If you already have ninja status and just want to get kicking, aim for the expansive open ridgetops, basins and face shots waiting for you on Sale Mountain or Keystone-Standard Basin, to the north. There’s also Mount Hall, to the south. Watch out for seasonal and permanent caribou closures—they’re for real! Have avalanche equipment, know how to use it and make sure you’ve checked Avalanche. ca for the bulletin. After you do, make it over to the groomed access at Boulder and Frisby Mountains that’ll shepherd you comfortably into the alpine. Remember to pay attention to the trail fees for grooming. If you want to rent a machine or hone your skills, there are several options in town for rentals and multi-day clinics. Download Boonmaps on your cell phone to access free trail maps that can be used along with GPS tracking while you’re out of cell service. A FOOD SCENE TO SAVOUR, WITH AWARD-WINNING LOCAL CRAFT BEERS & SPIRITS. Café your way through the day, après your way into the night. Grab a healthy and affordable breakfast or a wrap for the trail at one of many wholesome cafés. From there, lunch and dinner options extend into an impressive array of world cuisines: Japanese, German, Thai, Chinese, Vietnamese, French, and fusion. If you want to keep it simple, find a warm seat in a classic pub with menus serving everything from vegetarian fare to burgers. Classy joints? We have many multi-star stops you can dust off your dinner jacket for. Wash it all down with a frosty pint of local Mt. Begbie beer or get a locally distilled cocktail. Hit the dancefloor after or just gab into the wee hours over a set of suds as the night life takes over. Remember, “Last call, first chair!” PHOTO: MT. BEGBIE BREWING CO.
WANT A TRUE MOUNTAIN WEDDING? THEN YOU SHOULD GET HITCHED HERE. A backdrop of snow-blanketed peaks or lush green forest is the ultimate altar. Dream any setting you want and Revelstoke can deliver: a secluded cabin along the Columbia River, a secret hut deep in the forest, a luxury hotel in town, or a rustic backcountry lodge in the upper reaches of the alpine. If you just want to focus on your vows and none of the planning, we can do that too, a number of hotels and resorts will help customize your big day for you. You can also get as non-traditional as you want: tie the knot with an actual knot on at the top of a peak you climbed; say your pledges at the bottom of mountain bike trail you just ripped; or at the top of deep powder run waiting for the wedding party. Maybe you just want to have a potluck wedding by a lake in the woods? Everythingâ&#x20AC;&#x2122;s an option here. KERI KNAPP - Wedding photography. They say staying limber keeps you young. Hit up one of Revelstoke’s yoga studios downtown for a drop-in class, then bounce over to one of several locally owned cafés for a healthy breakfast. In the afternoon, you can drive up the Meadows in the Sky Parkway in Mount Revelstoke National Park to wander amongst the wildflowers. Whatever you choose for the day, stay unplugged from your devices. A low-stress ski tour, mountain bike ride, or stay in a backcountry cabin or lodge is a great way to disconnect and purge the digital fuzz from your brain. Advanced yoga classes and mindfulness retreats are also available in town, and don’t skip out on getting a massage! During the snowy months, rent some snowshoes and stretch your legs along town’s Greenbelt trails, or in Mount Revelstoke National Park (see our snowshoeing section). VIBRANT, HISTORIC DOWNTOWN REVELSTOKE. Locally owned and operated specialty stores and restaurants to meet your every need and more. Revelstoke’s commercial character echoes its culture with a focus on health, wellness, recreation, and environment. You can shop for haute couture or Gore-Tex within a few feet, get specialty kitchen wares, find a smart shoe selection, rent a bike, buy a camping stove, peruse splitboards, book an adventure, or buy a new book. Not to mention the variety of eats. Stock up on ethically sourced self-styling products at a salon, or just lay back and enjoy the spa experience. Several storefronts showcase local arts, crafts and jewellery, which you’ll also find in spades at the downtown Farmers Market between May and October. Since its Victorian revitalization in 1986, Revelstoke’s stood out amongst Western mountain towns as having a strong sense of heritage that it maintains to this day. Heritage walking tours are available through the Revelstoke Museum & Archives in the summer, or ask about the free Heritage Walking Brochure at the Visitor Info Centre. JOURNEY THROUGH THE PAST AND PRESENT. Revelstoke was founded in the 1880s when the industrious trans-continental railway first forged its way through the rugged West. Born of ornate Victorian architecture, much of the city’s original flare survives to this day thanks to a strong mandate to preserve it. From the inception of Canadian mountain tourism to the contributions of logging and mining, it’s all a part of our heritage. Visit the art gallery and museums listed here (right) to learn how Rogers Pass became the birthplace of North American mountaineering. Stand on the historic Nels Nelsen ski jump in Mount Revelstoke National Park for a first-hand view of Revelstoke past and present. Visit the First Footsteps trail in Mount Revelstoke National Park for First Nations artwork. Stroll the Koo Koo Sint trail at the top of the park to follow in explorer David Thompson’s seminal footsteps. Revelstoke’s rich history comes to life with historical characters! Come, travel the river and hear the stories. Evenings, July & August. Presented by Wild Blue Yonder Rafting Adventures. 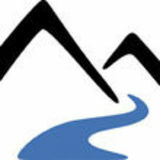 To book call 1-877-945-3786 or book online at www.revyraft.com or visit us at 621 Victoria Road, Revelstoke. LOOKING TO PURCHASE SOME REVELSTOKE LOCAL ART? 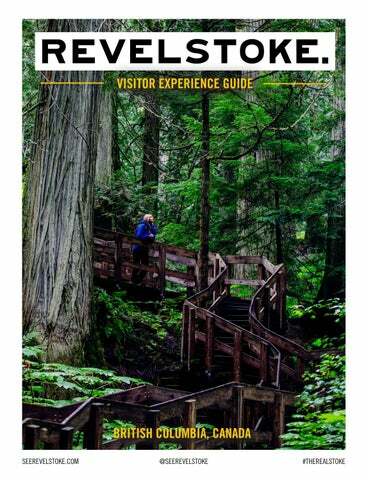 Head to the Revelstoke Visitor Centre on 301 Victoria Rd. to pick up some local swag, souvenirs and art (such as the two prints by Rob Buchanan featured on the right)! DISCOVER WHY REVELSTOKE IS CANADA’S REAL WONDERLAND. From the beach to the park, the mountain coaster to the trails, we’ve got something for everyone, at every age. Summer: On a hot day, hit the local swimming hole at Williamson Lake. You can also send the kids rafting in costume down the cruisy Columbia River with Revelstoke River Pirates—a theatre adventure on water. West of town there’s the Enchanted Forest, the Three Valley Gap Ghost Town, or SkyTrek Adventure Park—a fantasy land of tree-top bridge and ladder works with zip lines that’ll get your grownup heart pounding, too. Summer: Mount Revelstoke National Park is prime for family time. You can drive right to the top and have a picnic in perfect alpine wilderness. When you come back down, take an afternoon snack to the meandering shoreline of Martha Creek Provincial Park on Lake Revelstoke. Its warm waters and wide-open grassy playing fields are just a quick 15-minute drive up Highway 23 North. Winter: Come out of your shell at Revelstoke Mountain Resort’s Turtle Creek, where there’s a magic carpet for new skiers. You can also make waves year round at the Revelstoke Aquatic Centre, with a lap pool, hot tub, sauna, steam room, lazy river, water slide, and diving board. Winter: The open slope below the historic Nels Nelsen ski jump in Mount Revelstoke National Park is a perfect tobogganing spot. If you’re into starry nights and have a headlamp, you can also rent a pair of snowshoes and wander along Revelstoke’s Greenbelt trails. Summer: Drop in on Revelstoke Mountain Resort’s Pipe Mountain Coaster which is always the smash hit of summer. Dash through open forest on a self-controlled downhill roller coaster and compare times at the bottom. If you want the same feeling feeling on two wheels, take the kids to Mount Macpherson’s Stimulus, Dusty Beaver, Beaver Tail or Miller Time trails, where you can chase each other on mountain bikes for hours. Over at Mountain Revelstoke National Park, Beaver Lodge Kids Bike Park is also tailored specific for your young ones. Winter: Pack a thermos of hot chocolate to the Ole Sandberg Cabin at the Mount MacPherson Nordic trails. Then lose your voice cheering at a Revelstoke Grizzlies Junior B hockey game. Your child (and big kids, too) can live the fantasy and join this band of misfit pirates! Sing songs, learn jokes, battle with swords and find the gold! Presented by Wild Blue Yonder Rafting Adventures. SKYTREK ADVENTURE PARK & THE ENCHANTED FOREST Explore and play! Fun for all kids, big and small. Get a new perspective on at the Getpower a new perspective Revelstoke Dam on power at the Visitor Centre. Revelstoke Dam Visitor Centre. Bring your camera and get ready for an elevator ride thecamera top ofand ourget 175-meter dam, enjoy our Bringtoyour ready for an elevator interactive displays learn dam, how enjoy power is made. ride to the top of our and 175-meter our interactive displays and learn how power is made. We’re located only 5 km north of Revelstoke on We’re 23 located only 5 km of seven Revelstoke HWY North and arenorth open daysona week, HWY 23 North and are open seven days a week, 10 a.m. to 4 p.m. from Saturday, May 18 to 10 a.m. to 4 p.m. from Saturday, May 18 to Monday, September 2, 2019. Monday, September 2, 2019. Join forone oneofof our daily guided or explore Join us us for our daily guided tourstours or explore on ownwith with a self-guided on your your own a self-guided tour.tour. AudioAudio tour tour rentals are in multiple languages. rentals arealso alsoavailable available in multiple languages. To book your tour call 250 814 6697 or To book your tour call 250 814 6697 or visit at bchydro.com/revelstoke. visit at bchydro.com/revelstoke. Admission charges apply. Located in the heart of historic downtown Revelstoke, we are Revelstoke’s leader in accommodation, dining and service. This family owned and operated heritage hotel reflects the warmth and character of this mountain town community. The Explorers Society is more than just a hotel – it’s a destination. Housed in the 1911 McKinnon Building, we are Revelstoke’s modern heritage boutique hotel. Check out our reviews on TripAdvisor. Ski-in/Ski-out hotel at the base of Revelstoke Mountain Resort. Indulge yourself at our world-class, full-service resort community, where you’ll be greeted with exceptional services and amenities. This condominium style property features luxuriously appointed suites designed in a fresh contemporary style. Quiet, clean, friendly and affordable. A small comfortable motel, taking pride in making you feel at home. We want your stay to be memorable -- for all the right reasons! Our 46 guest rooms are offered with or without kitchens. The Revelstoke Gateway Inn can accommodate any group or family, yet is cozy enough to make you feel right at home. Great dining is only steps away. We are located just off the Trans-Canada Highway at the downtown Revelstoke access. All of our rooms provide the comfort and value that you have come to expect from a Super 8. Each clean and cozy room includes free local phone calls, fibre optic WiFi, complimentary ice, and air conditioning. We also have non-smoking rooms available and pets are welcome! Conveniently located next to a gas station. “Not your Grandma’s B&B.” Stay with the best, just 1.5 km from Revelstoke Mountain Resort! Featuring a hot tub, private ensuites, drying room, tune-up benches, organic breakfast, WiFi, comfy beds, soft linens, and organic toiletries. Cabins, suites, RV sites, glamping, and forested camping. We are located 3.5 km west of Revelstoke, on Highway #1. Your perfect base camp with direct access to the Boulder and Frisby trail head, with some of North Americas best snowmobile, ATV, hiking and biking trails. Bus: There are multiple daily shuttle bus transfers from Kelowna International Airport to Revelstoke, and our public transit system can get you around town from Monday to Saturday. Local taxi service is also available. As the Greyhound is ceasing operations, check out our website for updates on new bus providers. While in Revelstoke: The Revelstoke Resort Shuttle will pick you up throughout town and deliver you gleefully to and from Revelstoke Mountain Resort during the winter. Many accommodations include free shuttle passes with your stay, be sure to ask. BRUSH UP ON YOUR CANADIAN GEOGRAPHY. Air: Land in either Calgary or Vancouver if travelling from far, with regional connections possible to the nearby cities of Kelowna or Kamloops. Direct flights to Kelowna and Kamloops are also available from major North American hubs. There’s ground transfer between Kelowna International Airport and Revelstoke. Revelstoke Charter Flights: Arrive right where you want to be with Pacific Coastal Airlines. The company offers direct flights from Vancouver to Revelstoke during the winter, with transportation to and from your hotel included. Visit EverythingRevelstoke.com to book. Gourmet hand-pressed burgers, local Mt. Begbie Beer on tap, and great daily specials. Revelstoke’s Best Bar since 1932! Cold beer, wine and spirits located next door to the Regent Hotel. Handcrafted cocktails, incredible wine & food. Experience casual elegance in downtown Revelstoke. 1925 Laforme Blvd off the Trans Canada Highway | 1.855.837.2043 | revelstokebestwestern.com Each Best Western branded hotel is independently owned and operated.